This is “Introducing the Realm”, section 10.1 from the book Regional Geography of the World: Globalization, People, and Places (v. 1.0). For details on it (including licensing), click here. Outline the countries and territories that are included in East Asia. Describe the main physical features and climate types of each country. Understand the relationship between physical geography and human populations in East Asia. Summarize the main objectives in building the Three Gorges Dam. Describe how colonialism impacted China. Outline the various countries and regions that were controlled by colonial interests. 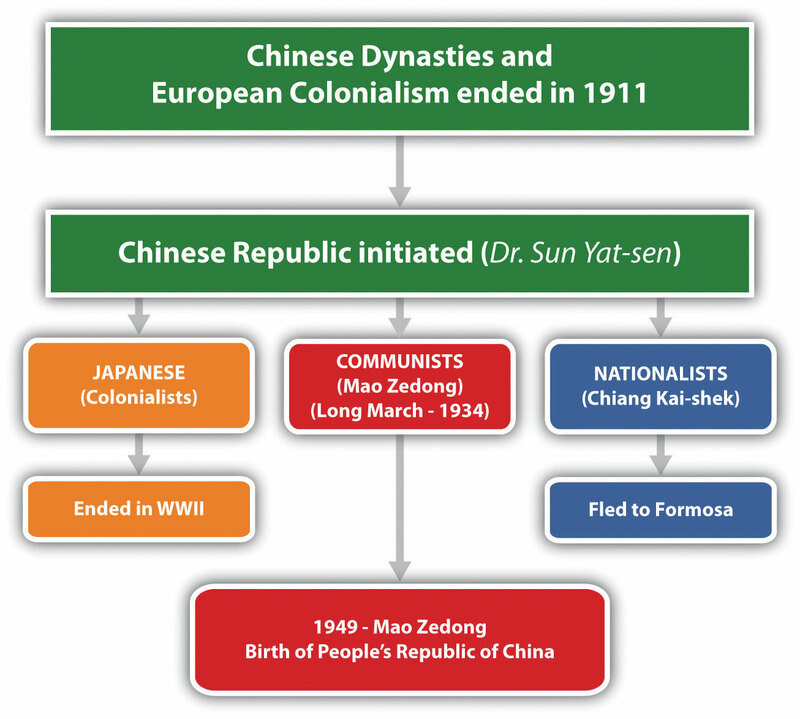 Outline the three-way split in China after its revolution and where each of the three groups ended up. East Asia is surrounded by a series of mountain ranges in the west, Mongolia and Russia in the north, and Southeast Asia to the south. The Himalayas border Tibet and Nepal; the Karakoram Ranges, Pamirs, and the Tian Shan Mountains shadow Central Asia; and the Altay Mountains are next to Russia. The Himalayan Mountains are among the highest mountain ranges in the world, and Mt. Everest is the planet’s tallest peak. These high ranges create a rain shadow effect, generating the dry arid conditions of type B climates that dominate western China. The desert conditions of western China give rise to a large uninhabitable region in its center. Melting snow from the high elevations feeds many of the streams that transition into the major rivers that flow toward the east. Created by tectonic plate action, the many mountain ranges are also home to earthquakes and tremors that are devastating to human livelihood. The Indian tectonic plate is still pushing northward into the Eurasian plate, forcing the Himalayan ranges upward. With an average elevation of fifteen thousand feet, the Tibetan Plateau is the largest plateau region of the world. It has high elevations and type H climates. The plateau is sparsely populated and the only places with human habitation are the river valleys. Lhasa is the largest city of the sparsely populated region. Sometimes called “the Roof of the World,” the Tibetan Plateau is a land of superlatives. The small amount of precipitation that occurs often comes in the form of hailstorms mixed with wind. Its landscape is generally rocky and barren. The vast arid regions of western China extend into the Gobi Desert between Mongolia and China. Colder type D climates dominate the Mongolian steppe and northern China. The eastern coast of the Asian continent is home to islands and peninsulas, which include Taiwan and the countries of Japan and North and South Korea. North Korea’s type D climates are similar to the northern tier of the United States, comparable to North Dakota. Taiwan is farther south, producing a warmer tropical type A climate. The mountainous islands of Japan have been formed as a result of tectonic plates and are prone to earthquakes. Since water moderates temperature, the coastal areas of East Asia have more moderate temperatures than the interior areas do. A type C climate is dominant in Japan, but the north has a colder type D climate. The densely populated fertile river valleys of central and southeastern China are matched by contrasting economic conditions. Rich alluvial soils and moderate temperatures create excellent farmland that provides enormous food production to fuel an ever-growing population. Most of China’s population lives in its eastern region, called China Proper, with type C climates, fresh water, and good soils. China Proper has dense population clusters that correspond to the areas of type C climate that extend south from Shanghai to Hong Kong. Around the world, most humans have gravitated toward type C climates. These climates have produced fertile agricultural lands that provide an abundance of food for the enormous Chinese population. To the south the temperatures are warmer, with hot and humid summers and dry, warm winters. The climates of China Proper are conducive for human habitation, which has transformed the region into a highly populated human community. The North China Plain at the mouth of the Yellow River (Huang He River) has rich farmland and is the most densely populated region in China. Northwest of Beijing is Inner Mongolia and the Gobi Desert, a desert that extends into the independent country of Mongolia. Arid type B climates dominate the region all the way to the southern half of Mongolia. The northern half of Mongolia is colder with continental type D climates. In the higher elevations of the highlands in western Mongolia, there is a section of type H highland climates. Its climate and location identify Mongolia as a landlocked country in the northern latitudes with a low level of precipitation. The areas of type D climate that extend north from Beijing through Northeast China at times receive more precipitation than northern Mongolia. Northeast China features China’s great forests and excellent agricultural land. Many of China’s abundant natural mineral resources are found in this area. Balancing mineral extraction with the preservation of agricultural land and timber resources is a perennial issue. Lying north of the Great Wall and encompassing the autonomous region of Inner Mongolia is the vast Mongolian steppe, which includes broad flat grasslands that extend north into the highlands. North China includes the Yellow River basin as well as the municipalities of Beijing and Tianjin. Areas around parts of the Yellow River are superb agricultural lands, including vast areas of loessExtremely fine silt or soil such as that found in the Yellow River Basin of China. that have been terraced for cultivation. Loess is an extremely fine silt or windblown soil that is yellow in color in this region. Deciduous forests continue to exist in this region, despite aggressive clearcutting for agricultural purposes. The Great Wall of China rests atop hills in this region. 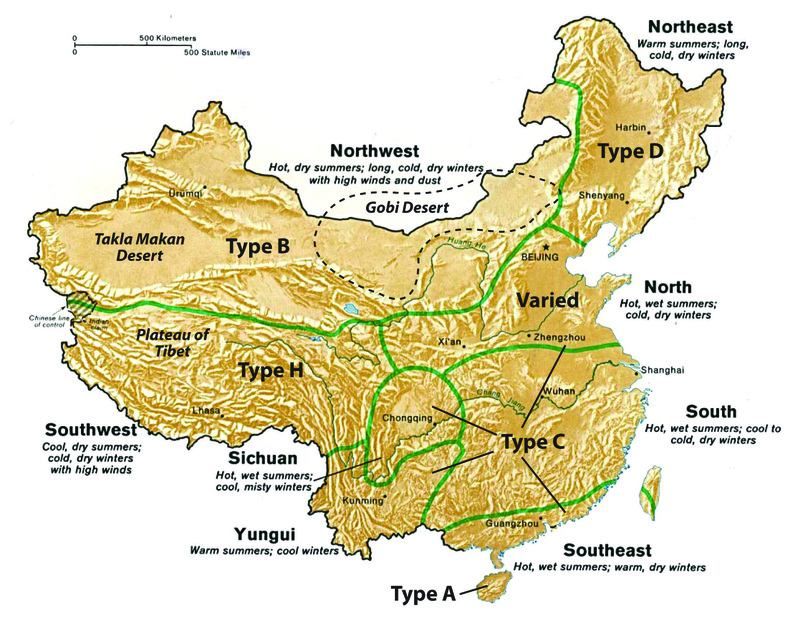 Most of western China is arid, with a type B climate. Western China has large regions like the Takla Makan Desert that are uninhabited and inhospitable because of hot summers and long cold winters exacerbated by the cold winds sweeping down from the north. In a local Uyghur language, the name Takla Makan means “You will go in but you will not go out.” To the far west are the high mountains bordering Central Asia that restrict travel and trade with the rest of the continent. Northwestern China is a mountainous region featuring glaciers, deserts, and basins. Source: Updated from map courtesy of University of Texas Libraries, http://www.lib.utexas.edu/maps/middle_east_and_asia/china_clothing.jpg. The central portion of China Proper is subtropical. This large region includes the southern portion of the Yangtze River (Chang Jiang River) and the cities of Shanghai and Chongqing. Alluvial processes give this area excellent agricultural land. Its climate is warm and humid in the summers with mild winters; monsoons create well-defined summer rainy seasons. Tropical China lies in the extreme south and includes Hainan Island and the small islands that neighbor it. Annual temperatures are higher here than in the subtropical region and rainfall amounts brought by the summer monsoons are at times very substantial. This area is characterized by low mountains and hills. There are two major river systems that provide fresh water to the vast agricultural regions of the central part of China Proper. The Yellow River (Huang He River) is named after the light-colored silt that washes into the river. It flows from the Tibetan highlands through the North China Plain into the Yellow Sea. Dams, canals, and irrigation projects along the river provide water for extensive agricultural operations. Crops of wheat, sorghum, corn, and soybeans are common with vegetables, fruit, and tobacco grown in smaller plots. 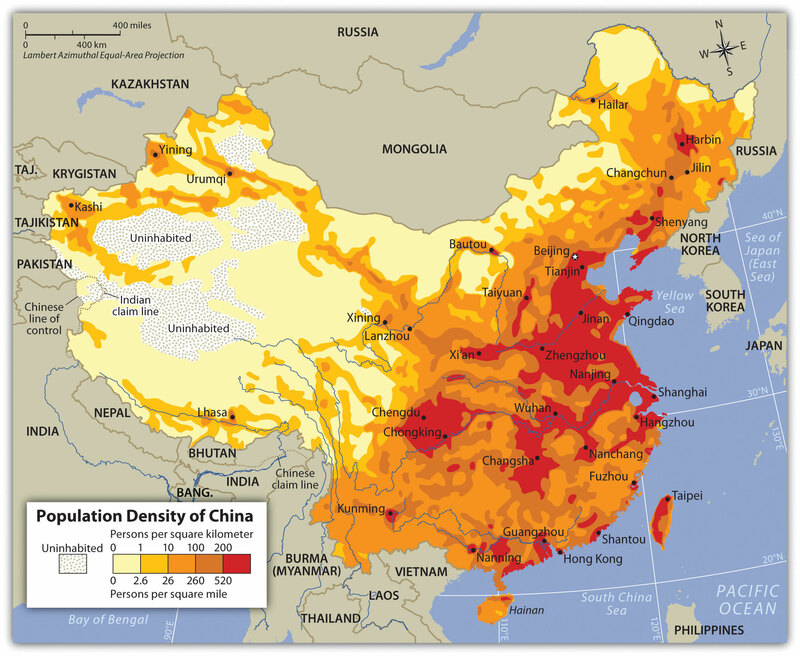 The North China Plain has to grow enough food to feed its one thousand people per square mile average density. This plain does not usually produce a food surplus because of the high demand from the large population of the region. Beijing borders the North China Plain. Its nearest port, Tianjin, continues to expand and grow, creating an economic center of industrial activity that relies on the peripheral regions for food and raw materials. Cotton is an example of a key industrial crop grown here. The Yangtze River (Chang Jiang River) flows out of the Tibetan Plateau through the Sichuan Province, through the Three Gorges region and its lower basin into the East China Sea. Agricultural production along the river includes extensive rice and wheat farming. Large cities are located on this river, including Wuhan and Chongqing. Nanjing and Shanghai are situated near the delta on the coast. Shanghai is the largest city in China and is a growing metropolis. The Three Gorges Dam of the Yangtze River is the world’s largest dam. It produces a large percentage of the electricity for central China. Oceangoing ships can travel up the Yangtze to Wuhan and, utilizing locks in the Three Gorges Dam, these cargo vessels can travel all the way upriver to Chongqing. The Yangtze River is a valuable and vital transportation corridor for the transport of goods between periphery and core and between the different urban centers of activity. Sichuan is among the top five provinces in China in terms of population and is dependent on the Yangtze River system to provide for its needs and connect it with the rest of China. The region of eastern China that is favorable to large populations is called China Proper. River basins historically produce abundant food, which in turn leads to concentrated populations. Northeast China was formerly known as Manchuria, named after the Manchu ethnic group that had dominated the region in Chinese history. Two river basins create a favorable industrial climate for economic activity. The lower Liao River Basin and the Songhua River Basin cut through Northeast China. The cities of Harbin and Shenyang are industrial centers located on these rivers. This region is known as the Northeast China Plain. It has extensive farming activities located next to an industrial landscape of smokestacks, factories, and warehouses. Considerable mineral wealth and iron ore deposits in the region have augmented the industrial activities and have created serious environmental concerns because of excessive air and water pollution. In its zenith in the 1970s, this was China’s main steel production area, but the region is being reduced to a rustbelt since many of China’s manufacturing centers are now being developed in the southern regions of China Proper. The southernmost region of China Proper is home to the Pearl River Basin, an important agricultural and commercial district. Though smaller in size than the Yangtze River Basin, major global urban centers are located on its estuary, where the mouth of the river flows into the South China Sea. 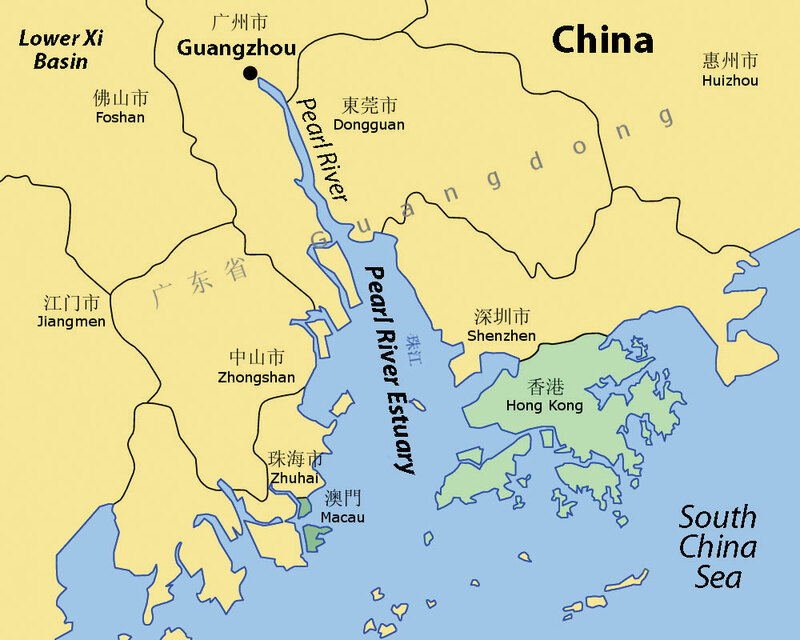 The system includes the Xi River, Pearl River, and their tributaries. As the third-longest river system in China, these rivers process an enormous amount of water, and have the second-highest volume of water flow after the Yangtze. Guangzhou, Macau, and Hong Kong are the largest cities located here, alongside the rapidly expanding industrial center of Shenzhen. As mentioned earlier, Macau was a former Portuguese colony and Hong Kong was a former British colony. These urban areas are now hubs for international trade and global commerce. Guangzhou is one of the largest cities in China, along with Shanghai, Beijing, Wuhan, and Tianjin. Cantonese heritage and traditions form a foundation for the cultural background of the people who live here. An estuary is a wide area at the mouth of a river where it meets the sea. Hong Kong is located on the eastern side of the Pearl River Estuary, and the former Portuguese colony of Macau is located on the western side of the waterway. Source: Updated from map courtesy of Croquant, http://commons.wikimedia.org/wiki/File:Pearl_River_Delta_Area.png. The Three Gorges Dam on the Yangtze River is known in China as the New China Dam. Its hydroelectric production system is the largest on Earth. The river system is the world’s third longest, after the Nile and the Amazon. Ideas for this project go back to the days just after the last dynasty fell. Plans and development began in the decades before 1994, when the construction of the dam began. The main purposes of the dam are to control the massive flooding along the Yangtze, produce hydroelectric power, and increase shipping capacity along the river. 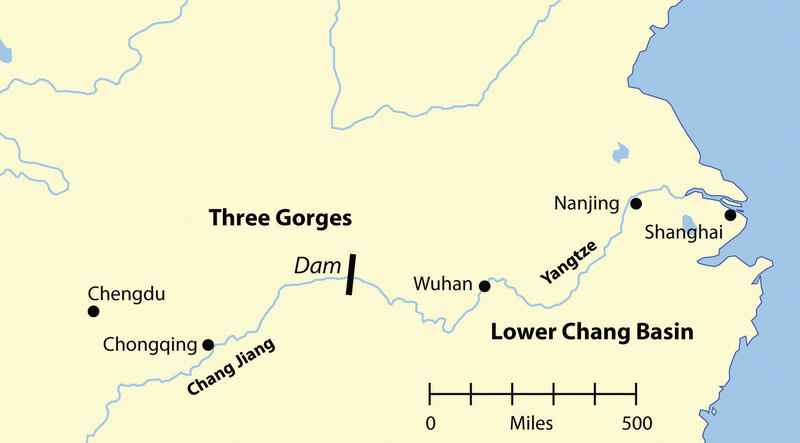 The Yangtze River flows through three deep gorges where a dam has been constructed to stabilize flooding, produce electricity, and support river transportation. Before construction of the dam, flooding along the Yangtze cost thousands of lives and billions of dollars in damage. In 1954, the river flooded, causing the deaths of more than thirty-three thousand people and displacing an additional eighteen million people. The giant city of Wuhan was flooded for three months. In 1998, a similar flood caused billions of dollars in damage, flooded thousands of acres of farmland, resulted in more than 1,526 deaths, and displaced more than 2.3 million people. The dam was rigorously tested in 2009, when a massive flood worked its way through the waterway. The dam was able to withstand the pressure by containing the excess water and controlling the flow downstream. The dam saved many lives and prevented billions of dollars in potential damage. The savings in human lives and in preventing economic damage are projected to outweigh the cost of the dam in only a few decades. The dam produces most of the electricity for the lower Yangtze Basin, including Shanghai, the largest city in China. Five years of the dam producing electricity has already paid for about one-third of its construction costs, which is equivalent to burning approximately 150 million tons of coal (depending on coal quality). This reduces the emission of millions of tons of carbon dioxide, sulfur, and nitrogen oxides into the atmosphere, which reduces air pollution and does not contribute to climate change. Heavy freight traffic on the Yangtze was the norm even before the dam was built; in fact, it has the highest rates of transport of any river. The building of the dam has augmented the amount of freight traffic. China’s Three Gorges Dam on the Yangtze River is the largest dam in the world. Source: Photo courtesy of Rehman, http://commons.wikimedia.org/wiki/File:ThreeGorgesDam-China2009.jpg. All the positive attributes of the Three Gorges Dam have contributed to the economic development of China. This is a testimony to the engineering and technological capacity of the nation. However, this project has also created its own problems and negative impacts on culture and the environment. By 2008, the number of people forced to relocate from the flooding of the reservoir had reached 1.24 million. Historic villages and hundreds of archaeological sites were flooded. Thousands of farmers had to be relocated to places with less productive soils. Compensation to the farmers for relocation was forfeited because of corruption and fraud. Sadly, much of the scenic beauty of the river basin is now under water. Animal species like the critically endangered Siberian Cranes, who had wintered in the former wetlands of the river, had to find habitat elsewhere. The endangered Yangtze River Dolphin has been doomed to extinction because of the dam and the amplified river activity. The dam restricts the flushing of water pollution and creates a massive potential for landslides along its banks, exacerbating the potential for the silting in of the reservoir and the clogging of the dam’s turbines. The dam also sits on a fault zone and there is concern that the massive weight of the water in the reservoir could trigger earthquakes that may destroy the dam, with catastrophic consequences. Large development projects tend to have an enormous impact on the people and the environment that inhabit their shadow. The building of the Three Gorges Dam has created controversy, with strong arguments on both sides of the issues. To further complicate the situation, other large dams are being proposed or are under construction along the same river. The earliest Chinese dynasty dates to around 2200 BCE. It was located in the rich North China Plain. Organized as a political system, Chinese dynasties created the Chinese state, which provided for a continuous transfer of power, ideas, and culture from one generation to another. From 206 to 220 CE, the Han Dynasty established the Chinese identity; Chinese people became known as People of Han or Han Chinese. The last dynasty, the Qing (Manchu) Dynasty, which ruled between 1644 and 1911, claimed control of a region including all of China, Mongolia, Southeast Asia, and Korea. Dynastic rule ended in China in 1911. 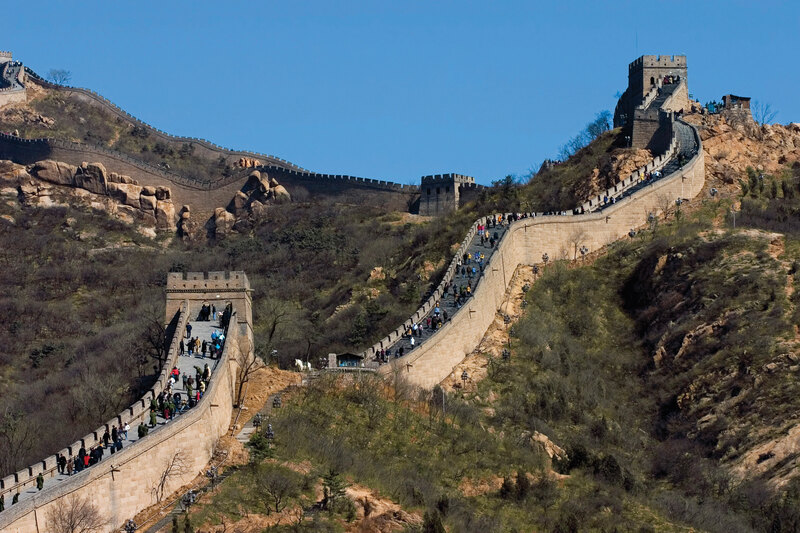 Construction started in the seventh century BCE and, including all its branches, the wall is about 5,500 miles long. Europeans colonized the Americas, Africa, and South Asia, and it was only a matter of time before technology, larger ships, and the European invasion reached East Asia. European colonialism arrived in China during the Qing Dynasty. China had been an industrialized state for centuries; long before the empires of Rome and Greece were at their peak, China’s industrial cities flourished with the concepts of clean drinking water, transportation, and technology. Paper, gunpowder, and printing were used in China centuries before they arrived in Europe. The Silk RoadLand route from China to Europe through the high mountains of Central Asia., which crossed the often dangerous elevations of the high mountain passes, was the main link between China and Europe. European colonial powers met tough resistance in China. They were kept at bay for years. Meanwhile, the Industrial Revolution in Europe, which cranked out mass-produced products at a cheap price, provided an advantage over Chinese production. British colonizers also exported opium, an addictive narcotic, from their colonies in South Asia to China to help break down Chinese culture. By importing tons of opium into China, the British were able to instigate social problems. The first Opium Wars of 1839–1842 ended with Britain gaining an upper hand and laying claim to most of central China. Other European powers also sought to gain a foothold in China. Portugal gained the port of Macau. Germany took control of the coastal region of the rich North China Plain. France carved off part of southern China and Southeast Asia. Russia came from the north to lay claim to the northern sections of China. Japan, which was just across the waterfront from China, took control of Korea and the island of Formosa (now called Taiwan). Claims on China increased as colonialism moved in to take control of the Chinese mainland. Though European powers laid claim to parts of China, they often fought among themselves. China did not produce heavy military weapons as early as the Europeans did and therefore could not fend them off upon their invasion. Chinese culture, which had flourished for four thousand years, quickly eroded through outside intrusion. It was not until about 1900, when a rebellion against foreigners (known as the Boxer Rebellion) was organized by the Chinese people, that the conflict reached recognizable dimensions. The Qing Dynasty dissolved in 1911, which also signified an end to the advancements of European colonialism, even though European colonies remained in China. European colonialism in China slowed after 1911, and World War I severely weakened European powers. The Japanese colonizers, on the other hand, continued to make advancements. Japan did not have far to travel to resupply troops and support its military. In China, a doctor by the name of Dr. Sun Yat-sen promoted an independent Chinese Republic, free from dynastic rule, Japan, or European colonial influence. Political parties of Nationalists and Communists also worked to establish the republic. Dr. Sun Yat-sen died in 1925. The Nationalists, under the leadership of Chiang Kai-shek, defeated the Communists and established a national government. Foreigners were evicted. The Communists were driven out of politics. Both the Republic of China (ROC) and the People’s Republic of China (PRC) consider Dr. Sun Yat-sen to be a famous Chinese historical figure. Nationalists, Communists, and Japan conducted a three-way war over the control of China. Japan’s military took control of parts of Northeast China, known as Manchuria, and were making advancements on the eastern coast. Nationalists defeated the Communists for power and were pushing them into the mountains. The Chinese people were in support of the two parties working together to defeat the Japanese. The Long March of 1934 was a six-thousand-mile retreat by the Communists through rural China, pursued by Nationalist forces. The people of the countryside gave aid to the efforts of the Communists. The Chinese were primarily interested in the defeat of Japan, a country that was brutally killing massive numbers of China’s people in their aggressive war. In 1945, the defeat of Japan in World War II by the United States changed many things. Japan’s admission of defeat prompted the end of Japanese control of territory in China, Taiwan, Korea, Southeast Asia, and the Pacific. By 1948, the Communists, who were becoming well organized, were defeating the Nationalists. Chiang Kai-shek gathered his people and what Chinese treasures he could and fled by boat to the island of Formosa (Taiwan), which in 1945 had just been freed from Japan. Taiwan was declared the official Republic of China (ROC). The Communists took over the mainland government. In 1949, Communist leader Mao Zedong declared the establishment of the People’s Republic of China (PRC) with its capital in Peking (Beijing). Japan was devastated by US bombing and defeated in World War II; its infrastructure destroyed and its colonies lost, Japan had to begin the long process of rebuilding its country. Korea was finally liberated from the Chinese dynasties and Japanese colonialism but began to experience an internal political division. Political structures in the second half of the twentieth century in East Asia were vastly different from the political structures that had been in place when the century began. China is the largest country in physical area and in population in East Asia. The realm is isolated by the high mountains in the west, which cause a major rain shadow and desert conditions in the western regions. Mongolia is the only landlocked country. The other countries and territories are located along the Pacific Rim. Robust population growth has been supported by adequate food production in the major river valleys and coastal regions of East Asia. Coastal areas receive adequate precipitation and allow access to fishing for human activities. The Three Gorges Dam was constructed on the Yangtze River to control flooding, generate electricity, and support shipping. The dam is the largest in the world. Downsides of the dam have included the relocation of human settlements, erosion, and other environmental concerns. Colonialism infiltrated China and challenged its last dynasty. By 1911, both the dynasty and European colonialism were in demise. In a three-way battle for power in China, the Communists emerged in 1949 to take control. The Nationalists fled to Formosa to form their own government. Outline the countries or territories that make up the region known as East Asia. How is East Asia separated from the rest of Asia? How did this keep the realm isolated for many centuries? What is the only landlocked country in East Asia? Describe its physical features. What are the main climate types in each of the countries in East Asia? 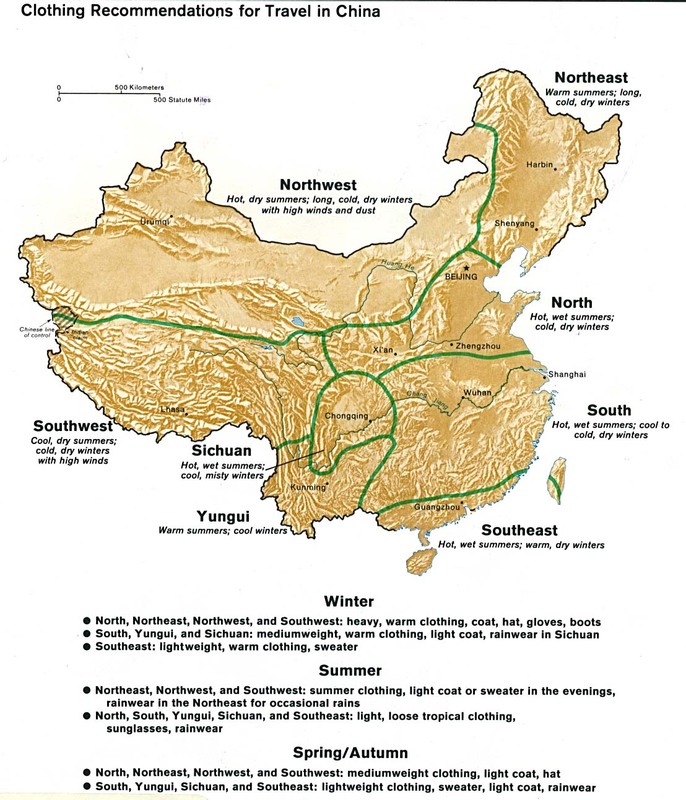 Where are the four main river basins in China Proper? How do they contribute to China’s development? 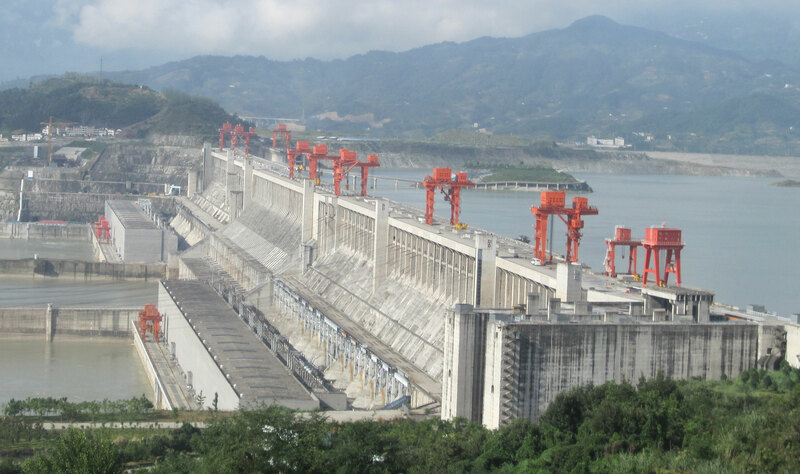 What are the three main benefits of the Three Gorges Dam? What are three of the negative impacts? What was significant about the Han and Qing Dynasties? When did dynastic rule end in China? How did the British attempt to break down Chinese culture? What was China’s response? What was the relationship between Japan, Korea, and China before World War II? What was the three-way split in China about? What happened to each of the three groups?